I received a copy of one of my favorite Christian publications and was amazed to see an article by the editor condemning presidential candidate Barack Obama because of the outrageous statements made by his former pastor. The writer inquired, how can we elect a man to run this country when he was anointed by this flamboyant and controversial pastor? 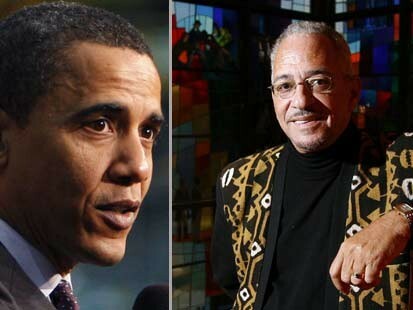 How could Obama spend 20 years in a church and not be 100% in line with his former pastor. Is any Christian 100% in line with what his or her pastor says? I attended a church for years where the pastor spoke against the gift of tongues. Unbeknownst to my former pastor, I had received this gift of the Spirit in my dormitory room during an hour of Bible study and prayer. I wasn’t seeking it... but God was gracious to give it. I kept the fact of my gift quiet and just continued to, as my god-sister told me, chew up the meat and spit out the bones. In other words, accept those things that you can digest and ignore those things that you can’t. the majority of the pastor’s teaching. Whenever my former pastor said something that I didn’t completely cotton to, I would simply chew on the meat and spit out the bones. So I can understand how Obama could spend 20 years in a church and not be 100% in line with any controversial statements made by his former pastor. Maybe he kept attending because of the chicken dinners? There is a big difference between a pastor who disagrees or is against the gift of tongues then a pastor who overtly spews hatred from the pulpit. I once attended a church and left it when a guest speaker was espousing his whiteness (versus being black). That bothered me a lot and I am white. Barack Obama should have known better -- his credibility has taken a damaging hit ever since these revelations were made known.